A bedroom is a very private space that must have a cozy ambience to allow you to relax and sleep easily and comfortably. For this, the bedroom must not be cluttered, must have unobstructed space for movement so that even if you wake up sleepily to go to the bathroom, you will not bump into furniture. 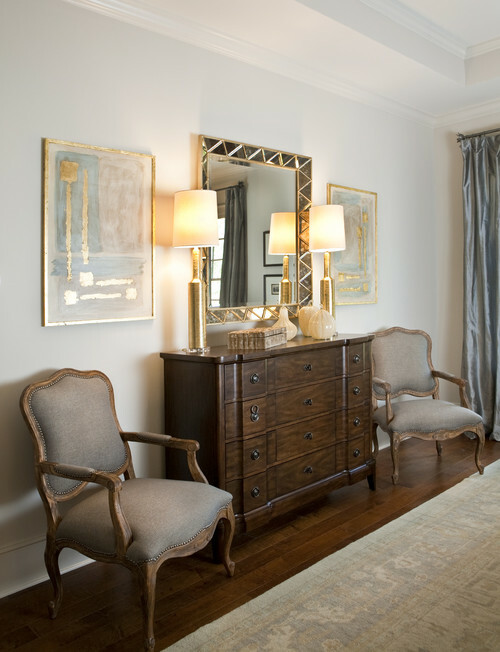 The furniture in a bedroom usually includes the bed, two side tables with lamps, a closet, a dressing table/nook, one or two armchairs, a TV stand, a dresser, a bookshelf and a writing table. Of these, the bed is the most important piece of furniture in a bedroom and must be placed correctly. The lighting and furniture around it must be right. Other than the bed, the other important furniture in a bedroom is the wardrobe or closet. My previous post was about maximizing storage space in a bedroom closet by clever organizing tips. With regard to the rest of the furniture, you can decide which pieces of furniture you want to include in your bedroom. However there are limitations if the bedrooms are small. As an Architect, I try to incorporate as many pieces of furniture as desired by the client by planning the furniture arrangement efficiently. This is how I do it. If the bedroom is really big sized, you can create separate rooms within the bedroom like a sleeping area, lounging area, office area like in the pictures shown here and below. This way, the spaces will be neat and private and can be closed off by sliding doors when desired. 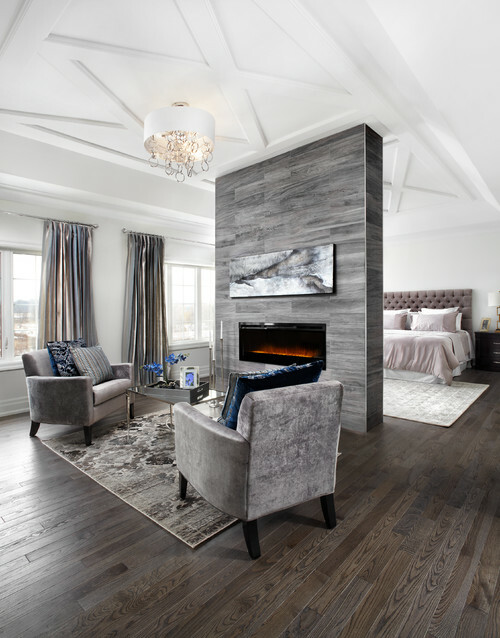 Instead of creating a separate room, you can demarcate the bedroom space into two areas with the help of a free standing wall like the one shown here. This gives semi-privacy to the bedroom. One area can be for placing the bed and the other area can be used for seating. Moreover, you can use both sides of the wall for a TV, fireplace, a dresser etc. The bed should always be placed against a wall, preferably the wall opposite the door that you enter from. But it should not be directly opposite the door. See the picture below. 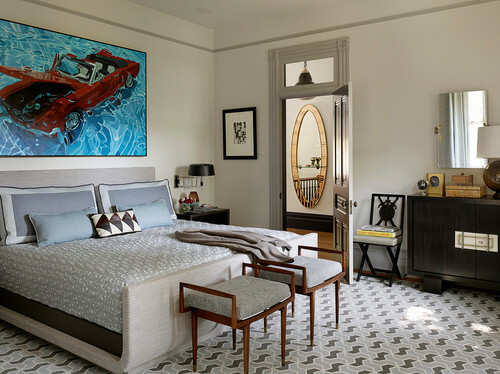 However in the picture below, the door to the bedroom opens bang against the bed, which is not ideal as there is no free circulation path into the room. The bed and the dressing table are blocking the movement. Usually two side tables are placed on either side of the bed. But it is not a hard and fast rule. You could replace it with any other piece of furniture that you want. You could replace one of the side tables with a chest of drawers if space is tight like in the picture below. But try to have one at the same height as the mattress as it looks more aesthetic and is easy to access. Or you could have a dressing table or a writing table like the one in this image, which again is almost at the height of the mattress. 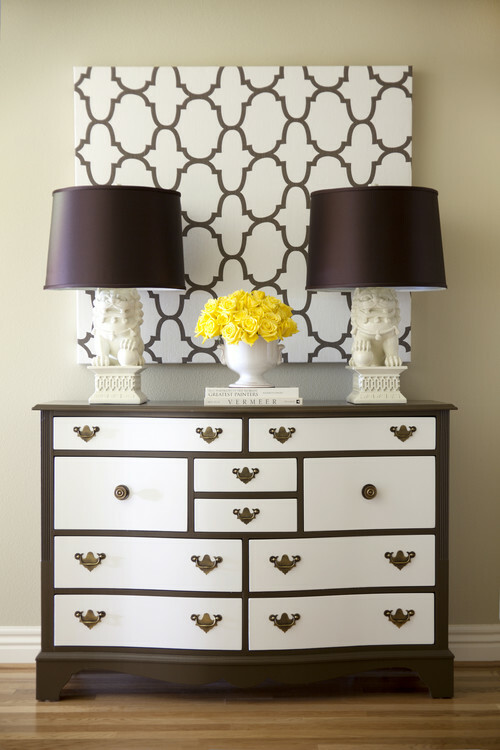 A chest of drawers also called a dresser can be placed as a stand-alone piece of furniture against a wall opposite to the bed. It serves as additional storage space and also as a mantle for placing a lamp, a flower vase, some knick knacks, books or a TV. See the images below. The design of the dresser should preferably match with the design of the bed and other furniture – not exactly but in the same design style and colours. For example, the above image shows a decorative style with matching lamps in the same colours. 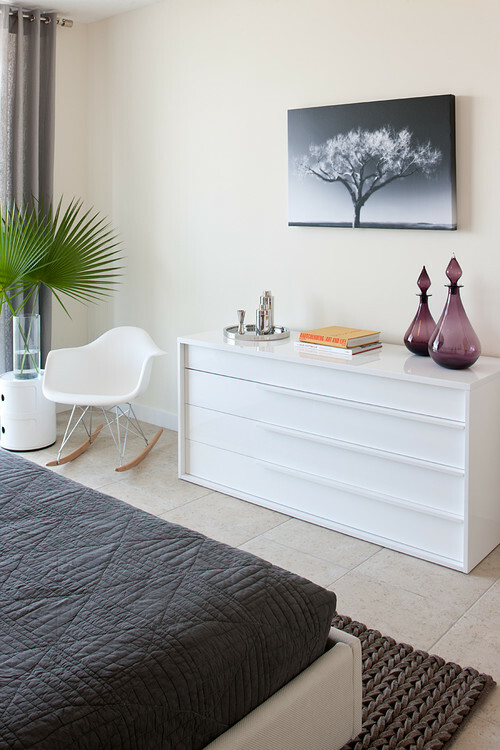 In the image above, the dresser is white and in a modernistic style, matching with the bed. On the other hand, the picture below has carved wooden furniture that go together and match with the wooden flooring. So there are so many interesting ways of teaming the furniture in the bedroom. 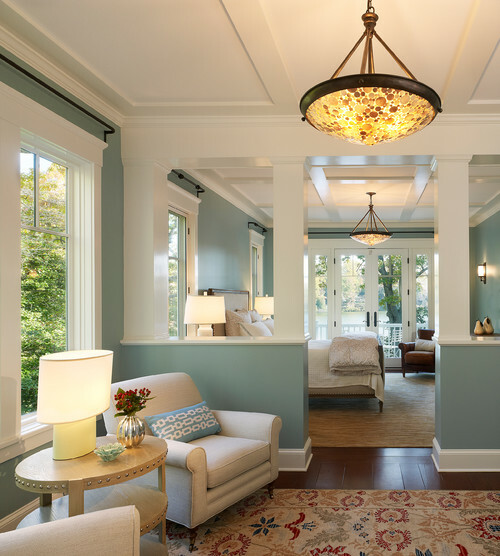 Ideally the seating in a bedroom should be near the window- to relax and have a cup of tea while looking out or read something. You can have two arm chairs like in the image below. Or you could have a window seat tucked into the window like the one shown here below. This is a cosy place to relax and read or just enjoy the view outside. Or if you prefer, you can have a chaise lounge (provided space permits) which could serve for lounging or resting in the company of friends. The right lighting in a bedroom can create a cozy atmosphere. 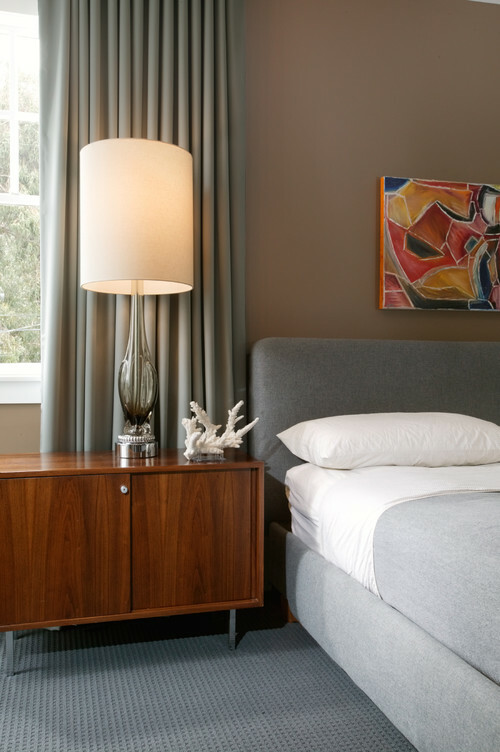 In addition to other wall lights and ceiling lights, usually there are two table lamps placed on the bedside tables on either side of the bed. The light from the table lamps is soft, unobtrusive light and suitable if one of the partners is sleeping and the other one wants to read or check the time or get up to go to the bathroom etc. But sometimes, to free up space on the bedside tables, you can opt for hanging lights like the one sen in the picture below. This is ideal when the bedrooms are small and the bedside tables are tiny. People tend to get a bit carried away by the lamps that they select. Sometimes they are over the top and at other times they are disproportionate to the room and surroundings. 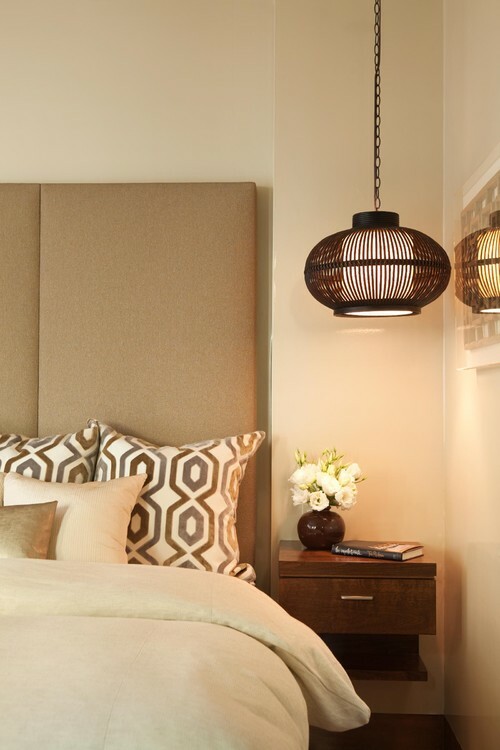 But the rule of thumb is that, the top of the lamp should not be higher than the headboard as it can look odd. See the image below. If the lamp is taller than the headboard, you should avoid having it near the bed. But it could be placed on a mantle or dresser elsewhere. In addition to all the furniture mentioned above, it is sometimes worthwhile to have an additional piece of furniture at the foot of the bed. It could be a chest, a small settee, a table or a bench. Of course this is possible only if there is enough space between the bed and the opposite wall. This additional piece of furniture is useful in many ways. It could be a place to stack some books that you intend to read or a place to sit and read. It could be a surface to fold your laundry before putting it away or a place to store your bed linens. There are so many uses for this piece of furniture. See the pictures below. A settee at the foot of the bed.